We have something great you can take to your next outdoor adventure. 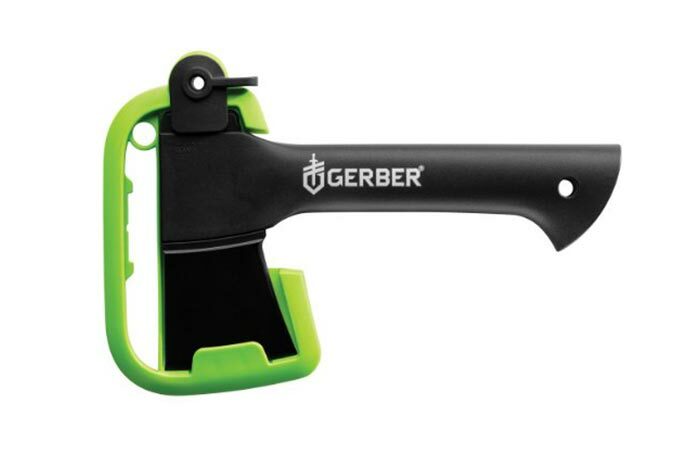 Gerber Back Paxe II High Performance Axe is small and almost indestructible. This mighty axe is made to be tough and provide you with the best performance. The axe has a stainless steel head and a glass filled nylon handle. With a handle like that, it’s both comfortable and secure to hold it and the head will remain sharp for a long period of time. It’s just 9 inches in length, but that doesn’t mean it’s less destructive. Because of its balanced construction and weight, it will provide an effective swing. There’s a plastic cover that protects the head. The combination of materials will ensure Gerber Back Paxe II High Performance Axe is durable and you have it for many years to come. Also, the head won’t corrode, so you can use it in all sorts of weather conditions. With the axe you get a plastic cover that protects the head during transportation. It weighs 16.9 ounces and because it’s quite small, you can easily pack it and take with you when you’re camping, hunting or hiking. It’s ideal for cutting tree branches and preparing fireplace. It’s best to use it on smaller branches, but it can be used as a tool for woodworking as well.